Amy Ridley certainly has her work cut out for her after she opens the freezer door backstage at a charity cooking event and is hit by the dead body of one of the rival chefs, Chef Britton. Amy’s friend Carla is dating Detective Bruce Shepler, so he has to turn the investigation over to a new member of Kellerton’s police force, Detective Pitts. Amy quickly realizes that Pitts has no ability to investigate anything. His technique consists of badgering people until they confess, or so he hopes. He is particularly keen to pin the murder on Carla because of her relationship with Shepler, but Amy isn’t about to let that happen. Suspects abound as Amy tries to figure out what actually happened. Chef Britton was universally hated, but who would be driven to murder him? Amy hunts for clues as she moves through this small Michigan town in the middle of winter, but nothing clicks until just before she herself is attacked and nearly killed. The plot has plenty of twists in it to make it a very pleasant cozy mystery. I did pick the murderer early on, but didn’t have all the pieces of the puzzle until the end. My only real objection to the story was that Detective Pitts seemed way too incompetent not to be called out by his boss. He was also painted as a bad cop with a heavy hand, stalking his favorite suspects in an unrealistic way. However, overall, the incompetency of Pitts increased the tension in the story and made Amy’s need to solve the crime correctly that much more intense. Even an incompetent cop can make an arrest and Amy didn’t want that happening to any of her friends, or herself for that matter. The story focuses around food and recipes are included for those who are cooks. 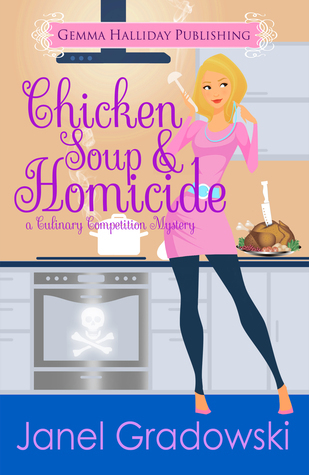 However, even though I am not a foodie, I really enjoyed this cozy mystery, so I can recommend it to mystery fans, whether they are cooks or not.